Lexington voters have chosen Dennis Ayers for City Council, giving the city its first openly gay elected official. Ayers took second place among four candidates with 1,278 votes, 25.85 percent of the total votes cast. Results were known less than an hour after polls closed at 7 p.m. on Tuesday. Two incumbents in the race will be returning to their seats next year. David Sigler came in first, with 1,349 votes, 27.29 percent of the total. Chuck Smith took third with 1,232 votes, 24.92 percent of the votes cast. Challenger Molly McCluer came in last. She received 1,016 votes, 20.55 percent of the total. Lexington voters cast their ballots at the Rockbridge Area Relief Association on Spotswood Drive. Ayers said he wants to focus on representing “boundary” neighborhoods, such as Lime Kiln, to bring more voters into an active conversation with the council. He also stressed fiscal responsibility throughout his campaign and wants to address problems with the older infrastructure in Lexington. Sigler and Smith ran primarily on their council experience. Sigler sought his second term, and Smith ran for his third. As a parent, Sigler told the Rockbridge Report that he can represent citizens with school-aged children. He said he shares young parents’ concerns about the schools, parks, safe neighborhoods and job opportunities. Smith, the owner of Washington Street Purveyors, a gourmet wine, cheese and sundries shop, said he is looking ahead to Lexington’s future. He said he wants to attract younger people to Lexington, which has an aging population. The nonpartisan city council has six members elected at-large on staggered terms. The mayor, the presiding officer, is a non-voting member but may vote to break a 3-3 tie on council matters. 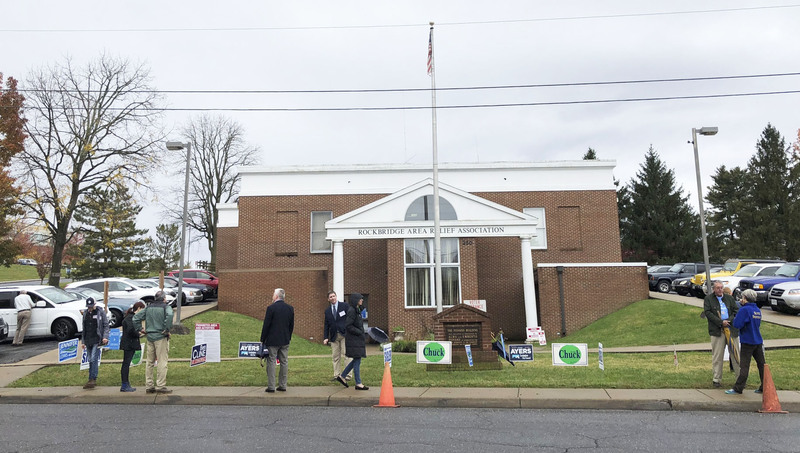 Lexington voters all cast ballots at the same polling location at the Rockbridge Area Relief Association building on Spotswood Drive.